In this paper we employ data on 156,000 workers working within the Finnish high-tech industries in order to identify the extent to which labour mobility between sectors and regions is influenced by the characteristics of the locality in which the worker works. With these data we are able to estimate different types of binary, multinomial and ordered logit models to capture different types of inter- or intra-sector or region employment mobility. As we will see the different categories of employment mobility are influenced by different factors such that we cannot simply talk about ‘labour mobility’, but rather need to be specific regarding each particular form of employment mobility. 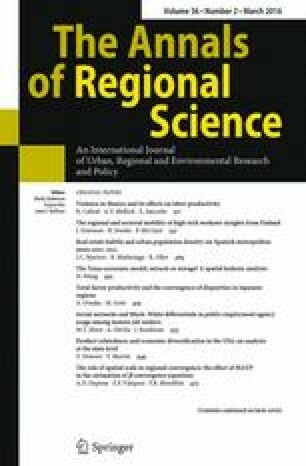 Our results show that urbanisation and industrial diversity are not just associated with greater intra-regional mobility, as is emphasised by the agglomeration literature, but also greater inter-regional mobility. The authors are grateful for valuable suggestions from two anonymous referees and financial support from the Academy of Finland and Yrjö Jahnsson foundation. Previous versions of this paper were presented at 53rd Congress of the European Regional Science Association, Palermo, Italy, 2013, and at 42nd annual conference of the Regional Science Association International - British and Irish Section, Sidney Sussex College, University of Cambridge, August, 2013.